I would like to acknowledge Burgess Winter, former CEO of Magma Copper Company, who passed away on September 17, 2018 at 85 years of age. Burgess was Vanto Group’s first strategic partner and major client in 1993. (At that time, Vanto Group was known as Landmark Education Business Development). Burgess was committed to the idea that breakthrough performance was achievable through empowering the “people factor” within companies. Not only were the business results at Magma unprecedented, but the team culture they built produced an exceptional quality of work life. 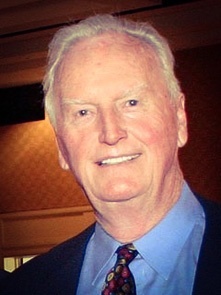 Burgess was ahead of his time as an early adopter of Vanto Group’s unique methodology, from the executive suite to the mine face and plant floor - “wall to wall transformation.” Vanto worked with nearly 5000 employees in Magma from 1993-1997 - executives, managers, supervisors, union officials and employees throughout all divisions and functions within both the U.S. and Peruvian operations. Many of Vanto’s current designs and competencies were initially validated at Magma - producing breakthrough performance solutions in the areas of safety, production, cost and employee engagement/well-being. With Burgess’ leadership, Magma became an extraordinary company receiving global awards and acknowledgements. During the month of October, Vanto Group is honoring Burgess for his vision, courage, and commitment. He was a pioneer for the “people factor” and made a sustainable difference in the mining industry and beyond. Please enjoy the video posted here citing recognition Magma received from the Clinton Administration in 1993 for its work in establishing innovative work systems and a high-performance organization. Thank you Burgess for being a strategic partner in our 26-year history. We will miss your presence.